Older age is the main risk factor for cancer. This largely reflects cell DNA damage accumulating over time. Damage can result from biological processes or from exposure to risk factors. This page covers other factors with the best evidence of an association with cancer risk; this list is not exhaustive. See our other pages for general information about cancer, or ways to reduce your risk. The estimated lifetime risk of being diagnosed with oesophageal cancer is 1 in 50 (2%) for males, and 1 in 96 (1%) for females born after 1960 in the UK. These figures have been calculated on the assumption that the possibility of having more than one diagnosis of oesophageal cancer over the course of a lifetime is very low (‘Current Probability’ method). Lifetime risk estimates calculated by the Statistical Information Team at Cancer Research UK. Based on Office for National Statistics (ONS) 2016-based Life expectancies and population projections. Accessed December 2017, and Smittenaar CR, Petersen KA, Stewart K, Moitt N. Cancer Incidence and Mortality Projections in the UK Until 2035. Brit J Cancer 2016. Esteve J, Benhamou E and Raymond L. Descriptive epidemiology. IARC Scientific Publications No.128, Lyon, International Agency for Research on Cancer, pp 67-68 1994. Data is for UK, past and projected cancer incidence and mortality and all-cause mortality rates for those born in 1961, ICD-10 C15. The calculations used past and projected cancer incidence and mortality and all-cause mortality rates for those born in 1961 to project risk over the lifetime of those born in 1961 (cohort method). Projections are based on observed incidence and mortality rates and therefore implicitly include changes in cancer risk factors, diagnosis and treatment. 59% of oesophageal cancer cases in the UK are preventable. International Agency for Research on Cancer (IARC) and World Cancer Research Fund/American Institute for Cancer Research (WCRF/AICR) classifications. Want to generate bespoke preventable cancers stats statements? Download our interactive statement generator. Brown KF, Rumgay H, Dunlop C, et al. The fraction of cancer attributable to known risk factors in England, Wales, Scotland, Northern Ireland, and the UK overall in 2015. British Journal of Cancer 2018.
International Agency for Research on Cancer. List of Classifications by cancer sites with sufficient or limited evidence in humans, Volumes 1 to 122*. Accessed October 2018. Lauby-Secretan B, Scoccianti C, Loomis D, et al. Body Fatness and Cancer--Viewpoint of the IARC Working Group. N Engl J Med. 2016 Aug 25;375(8):794-8. World Cancer Research Fund / American Institute for Cancer Research. Continuous Update Project Findings & Reports. Accessed October 2016.
International Agency for Research on Cancer (IARC) classifies the role of this risk factor in cancer developmentTobacco smoking is classified by the International Agency for Research on Cancer (IARC) as a cause of oesophageal cancer. 34% of oesophageal cancer cases in the UK are caused by smoking. Oesophageal AC risk is 2.7-2.8 times higher in smokers with 45-60+ pack-years , compared with never-smokers, meta- and pooled analyses have shown; risk increases with number of pack-years. [4,5] Oesophageal AC risk is 2.3 times higher in people with 40+ years of cigarette smoking, compared with never-smokers, a meta-analysis showed. Oesophageal AC risk is 2.5 times higher in people who smoke 20+ cigarettes per day, compared with never-smokers, one meta-analysis showed; however no association was found in a pooled analysis. Oesophageal AC risk is 29% lower in ex-smokers who quit 10+ years previously compared with continuing smokers, a pooled analysis showed; however those ex-smokers are still at 72% higher risk compared with never-smokers. Oesophageal squamous cell carcinoma (SCC) risk is 4.2 times higher in current smokers in Europe compared with never-smokers, a meta-analysis showed. Oesophageal SCC risk is 5.6 times higher in smokers with 60+ pack-years, compared with never-smokers, a pooled analysis showed; risk increases with number of pack-years. Oesophageal SCC risk among smokers is not associated with number of cigarettes smoked per day, a pooled analysis showed. Smoking and drinking alcohol have a synergistic effect on oesophageal SCC risk: their effect in combination is almost double the sum of their effects individually, a meta-analysis showed. Oesophageal squamous cell carcinoma (SCC) risk is around three times higher in people who chew areca nut (often included in betel quid), compared with non-users, a meta-analysis showed. Oesophageal SCC risk is around 6.8 times higher in people who chew areca nut and smoke, compared with people who do neither, a meta-analysis showed. Oesophageal cancer risk is 60% higher in ever-users of smokeless tobacco (including snuff and snus), compared with never-users, a meta-analysis showed. UK portrait version shown here. Country versions, cancers caused by other risk factors, and landscape formats are available for free from our cancer risk publications. Tramacere I, La Vecchia C, Negri E. Tobacco smoking and esophageal and gastric cardia adenocarcinoma: a meta-analysis. Epidemiology 2011;22(3):344-9. Cook MB, Kamangar F, Whiteman DC, et al. Cigarette smoking and adenocarcinomas of the esophagus and esophagogastric junction: a pooled analysis from the international BEACON consortium.J Natl Cancer Inst2010;102(17):1344-53. Lubin JH, Cook MB, Pandeya N, et al. The importance of exposure rate on odds ratios by cigarette smoking and alcohol consumption for esophageal adenocarcinoma and squamous cell carcinoma in the Barrett's Esophagus and Esophageal Adenocarcinoma Consortium. Cancer Epidemiol 2012;36(3):306-16. Prabhu A, Obi KO, Rubenstein JH. Systematic review with meta-analysis: race-specific effects of alcohol and tobacco on the risk of oesophageal squamous cell carcinoma. Aliment Pharmacol Ther 2013;38(10):1145-55. Prabhu A, Obi KO, Rubenstein JH. The synergistic effects of alcohol and tobacco consumption on the risk of esophageal squamous cell carcinoma: a meta-analysis. Am J Gastroenterol 2014;109(6):822-7. Akhtar S. Areca nut chewing and esophageal squamous-cell carcinoma risk in Asians: a meta-analysis of case-control studies. Cancer Causes Control 2013;(2):257-65. Boffetta P, Hecht S, Gray N, Gupta P, Straif K. Smokeless tobacco and cancer. Lancet Oncol 2008;(7):667-75.
International Agency for Research on Cancer (IARC) and World Cancer Research Fund/American Institute for Cancer Research (WCRF/AICR) classify the role of this risk factor in cancer development. 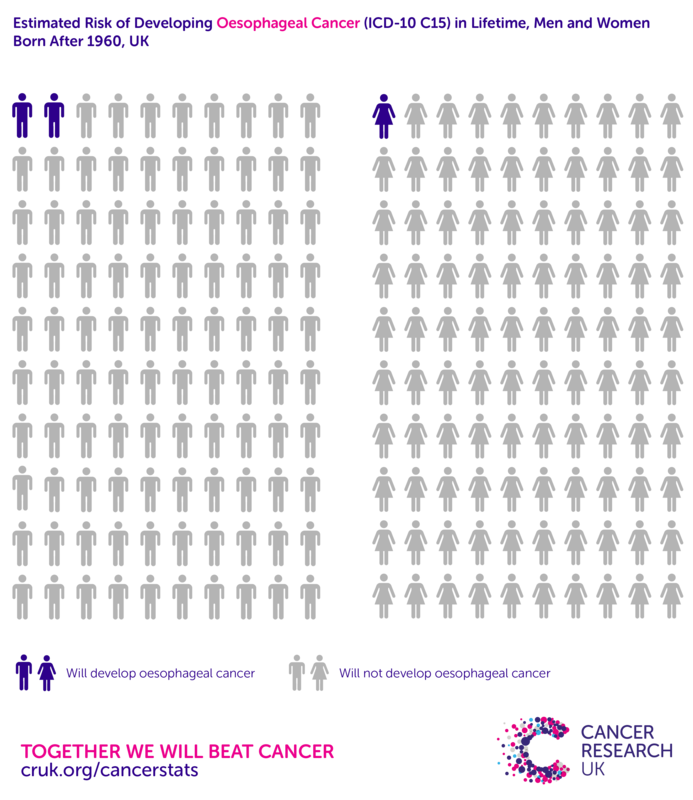 [1,2] 27% of oesophageal cancer cases in the UK are caused by overweight and obesity. Oesophageal AC risk is 2.5 times higher in people with the highest abdominal fatness (measured by waist circumference or waist-to-hip ratio), compared with healthy abdominal fatness level, a meta-analysis showed. World Cancer Research Fund / American Institute for Cancer Research. Continuous Update Project Findings & Reports. Accessed December 2016. Turati F, Tramacere I, La Vecchia C, Negri E. A meta-analysis of body mass index and esophageal and gastric cardia adenocarcinoma. Ann Oncol 2013;(3):609-17. Smith M, Zhou M, Whitlock G, et al. Esophageal cancer and body mass index: results from a prospective study of 220,000 men in China and a meta-analysis of published studies. Int J Cancer 2008;122(7):1604-10. Hoyo C, Cook MB, Kamangar F, et al. Body mass index in relation to oesophageal and oesophagogastric junction adenocarcinomas: a pooled analysis from the International BEACON Consortium. Int J Epidemiol 2012;41(6):1706-18. Singh S, Sharma AN, Murad MH, et al. Body mass index in relation to oesophageal and oesophagogastric junction adenocarcinomas: a pooled analysis from the International BEACON Consortium. Clin Gastroenterol Hepatol 2013;11(11):1399-1412.e7. International Agency for Research on Cancer (IARC) and World Cancer Research Fund/American Institute for Cancer Research (WCRF/AICR) classify the role of this risk factor in cancer development. [1,2] 13% of oesophageal cancer cases in the UK are caused by alcohol drinking. Oesophageal squamous cell carcinoma (SCC) risk is 34% higher in people who consume up to 12.5g (1.5 units) of alcohol per day, 2.6 times higher in those who consume around 12.5-50g (1.5-6 units) of alcohol per day, and 5.5 times higher in those who consume 50g+ (6+ units) of alcohol per day, compared with non- or occasional drinkers, a meta-analysis showed. The risk increase is independent of, but compounded by, smoking. Oesophageal SCC risk is 3.8 times higher in smokers with 200+ drink-years, compared with never-drinkers, a meta-analysis showed; risk increases with number of drink-years. Oesophageal cancer risk is no higher in ex-drinkers who quit 16.5 years previously compared with never-drinkers, a pooled analysis showed. World Cancer Research Fund / American Institute for Cancer Research. Continuous Update Project Findings & Reports. Accessed October 2018. V Bagnardi, M Rota, E Botteri, et al. Alcohol consumption and site-specific cancer risk: a comprehensive doseâresponse meta-analysis. Br J Cancer. 2015 Feb 3; 112(3): 580â593. Jarl J, Gerdtham UG. Time pattern of reduction in risk of oesophageal cancer following alcohol cessation--a meta-analysis. Addiction 2012;107(7):1234-43. Oesophageal adenocarcinoma (AC) risk is more than 11 times higher in people with Barrett’s oesophagus (BO) versus the general population, a cohort study showed. Around 3-13% of people with Barrett’s oesophagus in the UK will develop oesophageal AC in their lifetime. Oesophageal AC risk among BO patients increases with BO extent (higher in long-segment than short-segment) and severity (progressively higher through non-dysplastic[3,4] low-grade dysplastic or high-grade dysplastic). Oesophageal AC risk among BO patients is 36% lower in non-steroidal anti-inflammatory drugs (NSAIDs) users versus non-users, and 41-47% lower in statin users, both compared with non-users, meta-analyses have shown. [7-10] The risk reduction with statins may be limited to those with high-grade dysplasia and may be confounded by NSAIDs use. Hvid-Jensen F, Pedersen L, Drewes AM, Sørensen HT, Funch-Jensen P. Incidence of adenocarcinoma among patients with Barrett's esophagus. N Engl J Med 2011;365(15):1375-83. Gatenby P, Caygill C, Wall C, et al. Lifetime risk of esophageal adenocarcinoma in patients with Barrett's esophagus. World J Gastroenterol 2014;20(28):9611-7. Yousef F, Cardwell C, Cantwell MM, Galway K, Johnston BT, Murray L. The incidence of esophageal cancer and high-grade dysplasia in Barrett's esophagus: a systematic review and meta-analysis. Am J Epidemiol 2008;168(3):237-49. Desai TK, Krishnan K, Samala N, et al. The incidence of oesophageal adenocarcinoma in non-dysplastic Barrett's oesophagus: a meta-analysis. Gut 2012;61(7):970-6. Singh S, Garg SK, Singh PP, Iyer PG, El-Serag HB. Acid-suppressive medications and risk of oesophageal adenocarcinoma in patients with Barrett's oesophagus: a systematic review and meta-analysis. Gut 2014;63(8):1229-37. Zhang S, Zhang XQ, Ding XW, et al. Cyclooxygenase inhibitors use is associated with reduced risk of esophageal adenocarcinoma in patients with Barrett's esophagus: a meta-analysis. Br J Cancer 2014;110(9):2378-88. Wang F, Lv ZS, Fu YK. Nonsteroidal anti-inflammatory drugs and esophageal inflammation - Barrett's esophagus - adenocarcinoma sequence: a meta-analysis. Dis Esophagus 2010. Singh S, Singh AG, Singh PP, et al. Statins are associated with reduced risk of esophageal cancer, particularly in patients with Barrett's esophagus: a systematic review and meta-analysis. Clin Gastroenterol Hepatol 2013;11(6):620-9. Beales IL, Hensley A, Loke Y. Reduced esophageal cancer incidence in statin users, particularly with cyclo-oxygenase inhibition. World J Gastrointest Pharmacol Ther 2013;4(3):69-79. Alexandre L, Clark AB, Cheong E, et al. Systematic review: potential preventive effects of statins against oesophageal adenocarcinoma. Aliment Pharmacol Ther 2012;36(4):301-11. Kantor ED, Onstad L, Blount PL, et al. Use of statin medications and risk of esophageal adenocarcinoma in persons with Barrett's esophagus. Cancer Epidemiol Biomarkers Prev 2012;21(3):456-61. Oesophageal adenocarcinoma (AC) risk is 4.9 times higher in people who have gastro-oesophageal reflux disease (GORD, or GERD in American English spelling) symptoms at least weekly, versus people who have GORD symptoms less frequently or never, a meta-analysis showed. Oesophageal AC risk is 7.4 times higher in people who have GORD symptoms daily, versus people who have GORD symptoms less frequently or never, a meta-analysis showed. Oesophageal AC risk is 2.8 times higher in people who have had GORD symptoms for under 10 years, and 6.2 times higher in those who have had GORD symptoms for 20 years or more, both versus people who have never had GORD symptoms, a pooled analysis showed. Rubenstein JH, Taylor JB. Meta-analysis: the association of oesophageal adenocarcinoma with symptoms of gastro-oesophageal reflux. Aliment Pharmacol Ther 2010;32(10):1222-7. Cook MB, Corley DA, Murray LJ, et al. Gastroesophageal reflux in relation to adenocarcinomas of the esophagus: a pooled analysis from the Barrett's and Esophageal Adenocarcinoma Consortium (BEACON). PLoS One 2014 Jul;9(7):e103508. International Agency for Research on Cancer (IARC) classifies the role of this risk factor in cancer development. Oesophageal cancer (overall) risk is higher in people who consume tea, coffee, other drinks or food at higher temperatures, a systematic review showed. World Cancer Research Fund/American Institute for Cancer Research (WCRF/AICR) classifies the role of this risk factor in cancer development. Oesophageal squamous cell carcinoma (SCC) risk is 2.6 times higher in maté ever-drinkers versus never-drinkers, a meta-analysis showed. However, a pooled analysis of case-control studies found the risk increase was only 60%. International Agency for Research on Cancer. List of Classifications by cancer sites with sufficient or limited evidence in humans, Volumes 1 to 122. Accessed August 2018. Islami F, Boffetta P, Ren JS, Pedoeim L, Khatib D, Kamangar F. High-temperature beverages and foods and esophageal cancer risk--a systematic review. Int J Cancer 2009;125(3):491-524. Andrici J, Eslick GD. Maté consumption and the risk of esophageal squamous cell carcinoma: a meta-analysis. Dis Esophagus 2013;26(8):807-16. Lubin JH, De Stefani E, Abnet CC, et al. Maté drinking and esophageal squamous cell carcinoma in South America: pooled results from two large multicenter case-control studies. Cancer Epidemiol Biomarkers Prev 2014;23(1):107-16.
International Agency for Research on Cancer (IARC) classifies the role of this risk factor in cancer development. 3% of oesophageal cancer cases in the UK are caused by workplace exposures. International Agency for Research on Cancer (IARC) classifies the role of this risk factor in cancer development. Less than 1% of oesophageal cancer cases in the UK are caused by ionising radiation. Oesophageal cancer (overall) associated with radiotherapy for previous cancer occurs in survivors of breast (though evidence is mixed), lung, oropharyngeal and laryngeal cancers. Oesophageal cancer accounts for an estimated 46% of radiotherapy-attributable second cancers in breast cancer survivors in the UK. Grantzau T, Mellemkjær L, Overgaard J. Second primary cancers after adjuvant radiotherapy in early breast cancer patients: a national population based study under the Danish Breast Cancer Cooperative Group (DBCG). Radiother Oncol 2013;106(1):42-9. Maddams J, Parkin DM, Darby SC. The cancer burden in the United Kingdom in 2007 due to radiotherapy. Int J Cancer 2011;129(12):2885-93. Oesophageal adenocarcinoma (AC) risk is 25% lower in people who take aspirin twice a week versus people who don’t take aspirin (risk reduction plateaus at use 4.5 times per week), a meta-analysis showed. Oesophageal AC risk is 47% lower in long-term users of aspirin (3+ years) versus non-users (risk reduction plateaus at 6 years use). Oesophageal squamous cell carcinoma (SCC) risk is 39% lower in regular users versus never-users of aspirin. Xiaohua Y, Zhenjiang Y, Weidong L, Pengcheng X, Sidong C. The non-linear threshold association between aspirin use and esophageal adenocarcinoma: results of a dose-response meta-analysis. Pharmacoepidemiol Drug Saf 2014;23(3):278-84. Bosetti C, Rosato V, Gallus S, Cuzick J, La Vecchia C. Aspirin and cancer risk: a quantitative review to 2011. Ann Oncol 2012;23(6):1403-15.